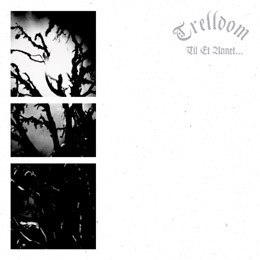 Originally released in 1998 through the very same label, Til Et Annet… was the second recording by Trelldom, a band with Kristian ‘Gaahl’ Espedal – think: Gorgoroth, Gaahlskagg, Sigfader, God Seed. Glad to hear it again, because it has been many years. Not because I dislike the stuff; on the contrary. Rather because of both an impressing collection and a busy schedule writing reviews (and therefor listening to tens of albums every single month; with gratitude to the Horned and Sulphur-spawning Gods of Black Sonics). I just seem to have forgotten this album, and I am ashamed. Apparently re-released a couple of years ago through Karmageddon, yet we (i.e. Concreteweb) weren’t informed, so all together: weep weep weep! Why? Because this simply is wonderful material. The stuff was recorded at the famous Grieghallen Studio with Mister Pytten (this might be a reason to appreciate the material), but it shows Gaahl’s unique vocal qualities as well. Musically, Trelldom’s assaults aren’t that über-impressive, but even now it does not seem old fashioned, despite the inherent Old Style attitude (and then again I will mention the Grieghallen greatness). Necrotic, morbid, mayhemic in its most evil definition, yet spiced with a subtle epic sound (that wonderful ‘Nordic’ approach, jummie! )… For sure a must for fans of the Norwegian scene (i.e. Massemord, Tulus, earlier Satyricon, Thule / Taake, Windir, and most of the bands / projects Gaahl is or was involved with)!